Okay, you train 3-4 days a week. You kumite every couple of weeks, you know all your style's katas, you're a virtual martial arts historian. You may have even won a trophy of two in competition. You can pound a makiwara, your Naihanchi stomps put fear into the mudansha, and everyone in 3 dojos acclaim you as the next Bruce Lee. Yet you have failed as a martial artist as you missed the most important part of martial arts training. I don't have studies to support this but I would imagine at least 8 out of 10 dojos talk about spirituality (not religion) in one form or another. They talk about it's importance to training, the need to cultivate "mizo no kokoro", the need to develop awareness in training, "focus", and the like. However lip service is where it stops. They do not actually train you - that’s because they don't know how? (Ask your Sensei; "Sensei, train me in mindfulness." Then watch for the deer in the headlight glazed-over look.) Don't feel bad, there are many, many, high ranking Blackbelts who cannot meditate, and would even know where to try to start. Without mind training, without a true and active focus/training in mindfulness, awareness, meditation; any student's training is incomplete. Go back and watch the first "Karate Kid" movie. (Yeah I know - sorry). But look at the core difference between the quiet Japanese-American instructor and the ex-special forces, "kill 'em all and let God sort them out" loud mouth instructor. Which are you? Or do you (more commonly) talk like Miagi but act like the "killer". If so, you lose. There's a great line in "Enter the Dragon" where O-Hara breaks a board in mid-air without support (a difficult feat). Bruce Lee looks at him and calmly says "Boards don't hit back". You know, you saw the movie, and you too misunderstood what he was saying. Breaking the board or hitting the opponent is fairly easy. When you overpower them, when you've become a karate machine, they present little danger to you. You ARE the master! Even if they beat you to a pulp your focus is still on THEM, how you're gonna get even, better, faster, smarter, etc. Your focus is still outside yourself either way - you lose either way. It's not the outside threat, it's the inner threat; looking inside, seeing, acknowledging oneself. Confronting that part of yourself you both hate and loathe. That secret shadow self you would NEVER tell another person about, you already know how their opinion of you would change forever if they knew you _______________ (fill in your own blank). That shadow self CANNOT be defeated; it won't hit back. Yet it controls your life. The more you try to suppress it, defeat it, control it, the more control you actually give your shadow over your physical self. You LOSE! The journey toward mastery of karate is a road you CANNOT complete without the mastery of self. Meditation, mindfulness training, forgiveness of self and, ultimately acceptance of self is the ONLY way the shadow self can be dealt with, compromised with, not defeated. Embracing the shadow reunites self with self, ying with yang, and this reunification is the only way you can quiet the battle of the inner turmoil. Again Bruce Lee's "The art of fighting without fighting…"
I'm not referencing religious training. Having a strong religious orientation may help fortify you for the inward journey but, in and of itself, will not get you there. Religious armor for battle won't work. In this battle you an only survive by NOT armoring yourself. 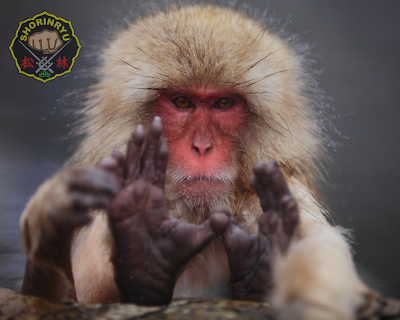 You ever see the monkey on Youtube with the Gi on? Looks like he knows karate? We laugh at him but it's a nervous laugh; inside we identify way too much with the monkey. Physical training without spiritual training only creates trained monkeys. Sure, some monkeys learn faster than others and are better than others, but their still monkeys. Monkey see, monkey do, but monkey not understand. The last entry on Kumite generated a number of private responses; some think I'm brilliant (thank you again) while others believe I should "increase your medication[sic]". The majority of the comments lie somewhere in the center of the continuum. Fortunately it's my blog, my thoughts. If you are offended by my ideas, here's an idea; don't read them. Tibetan Buddhism teaches words only offend us when we fear there is truth in what is being said. Hmmmm . . . . . . . I blame my current teacher, Sanchez Renshi, for your discomfort. He strongly encourages students there is the traditional way, the right way, the hard way, the wrong way, and the easy way. You (i.e. "I") have to decide what the truth is for me. It WOULD be a lot easier if he just told students what to do and believe but then he would simply be making little copies of himself. Instead he teaches the basics, keeps an ear open to innovation and discourages cronyism. Unfortunately he encourages my academic, pseudo intellectual prattle - what you're reading. 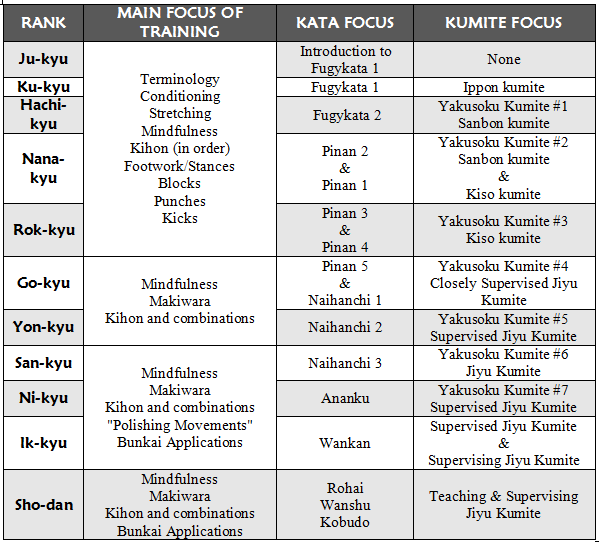 Anyway kumite really IS an important topic for every karateka, and something we all must learn conceptualize in order to continue training. If we simply repeat what we were taught "cause that's the way we've always done it" we are nothing more than robots. We can become very good robots but remain fearful of original ideas. First we must decide WHAT we believe. Example. Remember when you decided what your spiritual orientation was? Weather you believed in a deity or not? Of course not, you were indoctrinated by your parents, caregivers, and other significant adults. If you developed your own sense of self you one day did ask the question "What do I believe in and why?" You may or may not have changed your ideation but at least now it's YOUR belief and not an inter-generational transmission of un-reviewed belief. Kumite is the same. You reach the yudansha ranks, finally you're a recognized student, and hopefully start to ask yourself questions about what you believe and do not believe. Fortunately, for me, I have a strong background in anatomy and physiology. Even as a mudansha I soon learned many of the sacred cows of karate were delusions; e.g. 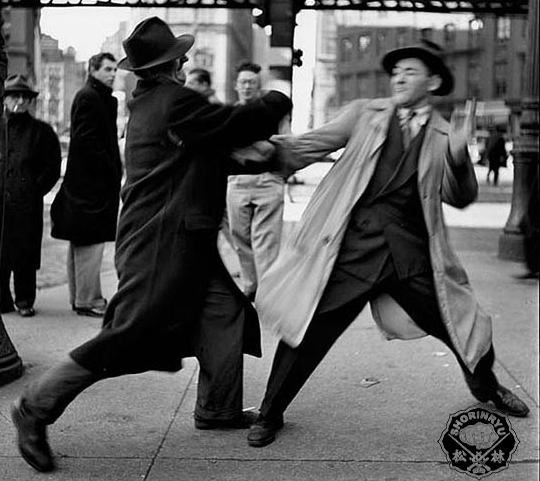 "you rotate your fist on a punch so that the twisting motion tears the flesh on contact." I started thinking; out of the hundreds (perhaps thousands) of patients I have seen struck with a fist how many had tear marks where the assailant's knuckles made contact. (1) No or minimal contact (occasional light contact slips in). (2) Moderate contact (although the word medium is seldom defined and tends to try to hide the words "testosterone driven"). Many times instructors (not true Sensei's but instructors) will tell students you have to get hit so you will not be afraid in a real fight or won't get hit and simply stop fighting because it hurts. Much like Communism this sounds like practical advice but is not based in reality. In a real fight (yes, been there) hormones are dumped into your system. What Cannon, in 1923, identified in his book "Traumatic Stress", and later became known as the "Fight or Flight Syndrome". We all have heard of this syndrome and may even talk about it in training carelessly not allowing our ignorance of the subject prevents us from talking about it. Tachycardia, Tachypnea, Slowing of digestion, Peripheral blood vessel constriction, Muscular blood vessel dilatation, Gluconeogenesis, Decreased tearing and saliva, production, Pupil dilatation, Focused hearing, and Focused visual acuity. All of these functions are each designed to enable you to fight your assailant or run swiftly away. Agnosia, agraphia, alexia, akathisia, amnesia, anomia, aphasia, apraxia, delirium, dysarthria and/or dyscalculia. So, to clarify, in a "real fight" the limbic system (our primitive "lizard" brain") prepares by increasing our oxygen intake, redirecting blood flow to large muscle masses, increasing our visual acuity in low light situations, producing energy by converting fat to glucose and pumping the highly oxygenated nutrient rich blood throughout our body. At the same time our brain is betraying us by limiting our ability to think, cognate, and remember the fancy 473 different bunkai applications associated with Pinan Sho-dan. Really? Yep, look it up. Now if you were to fight for your life once a month you COULD eventually develop a limited control over some of these functions. Remember even the "big gun" MMA stars know their opponent will not kill them. But wait, it gets worse; Neither the Flight or Fight Syndrome nor the Cortical Inhibition Syndrome can be reproduced in Kumite, unless you will occasionally kill a student and the student knows and believes this. So what then is the purpose of Kumite? -- That's the question you have to answer for yourself grasshopper. 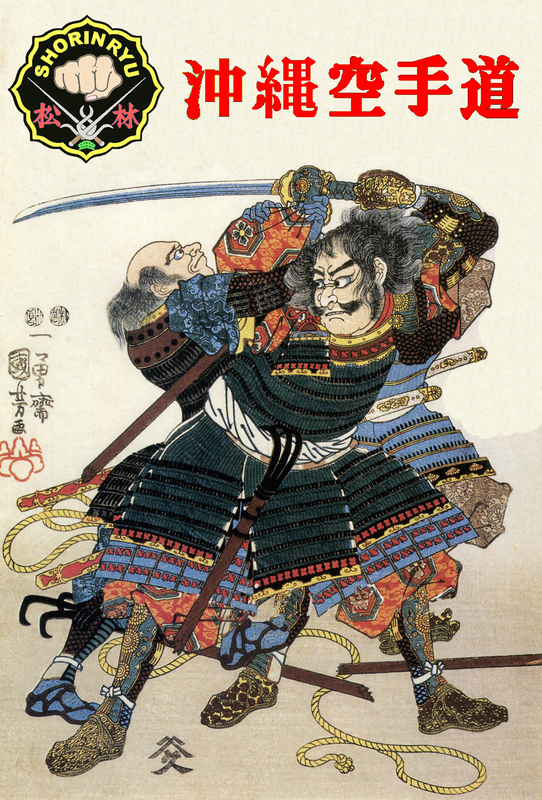 Uechi-Ryu Shinjo Seiyu Sensei used to have a saying on the wall of his dojo: "Shobu ha, Issho Ichido" (A fight occurs only once in a lifetime). He wasn't talking about a smack down, or a drunk throwing a punch he was talking about Thunderdome; "Two men enter, one man leaves". Think about it. So, summary: Kumite teaches you how to spar in the dojo, it fails to prepare you for "real fights" and can actually increase the odds of you being seriously injured in such a fight. On the practical side (we all have to make a living) kumite decreases your dojo enrollments by intimidating students who have the potential to become excellent martial artists IF they were taught, mentored and grown with care and attention. Okay now that I've annoyed you, the oblivious question is "If kumite doesn't work why even study karate?" To quote Monty Python "A fair question and one that's be much on my mind of late. . . "
( ((1) At it's core I maintain karate is NOT about fighting another person but about YOU coming to terms with who YOU are. Kumite does not help in this introspective process. To do this karate MUST have a spiritual component integrated into it. While I, and many others, prefer Buddhism, Christianity, Islam, Judaism etc. all can work. (3) It is a martial tradition that teaches mindfulness. Remember "Mizo no kokoro"? OK now for the million dollar question; if I don't practice kumite how will I ever learn to defend myself? Best answer; if your primary reason for learning karate is to learn to defend yourself, buy a gun and take lessons. It's cheaper, easier, and you'll feel safer within a couple of weeks. Go back to the Cortical Inhibition Syndrome above. In a crisis situation we (all of us) respond automatically, without thinking (mizo no kokoro). Our bodies respond reflexively, automatically based on the concept of "muscle memory". You block a sucker punch with a jodan-uke because you've practice delivering jodan-uke's literally thousand's of times by the time you tie the blackbelt on. Your body remember and reacts, the motion has become part of you, automatic. How do you learn to defend yourself: KATA!!!!!! Again I go to Uechi-Ryu Shinjo Seiyu Sensei (and many other Okinawan masters who did not teach or practice Kumite). Seiyu Sensei stated ". . . by correctly practicing kata, fighting is not needed." Kata is taught full force with emphasis on proper delivery. Exercises develop the body's ability to deliver power strikes and protect oneself from injury. Zazen is practiced to settle the mind. Most importantly, in every kata, every strike is also a block just as every block is also a strike. And of course, Makiwara (again). Here's a thought. If you brought in a Golden Gloves amateur boxer to your dojo's Kumite night and everyone went full contact, how many of your best Kumite artists would survive? (I'm betting on the boxer) Don't believe me - I DARE YOU TO TRY IT! I DARE YOU! Show me a karateka who practices kata precisely, accurately and with power and you'll be looking at someone who will survive a street encounter. Who would you rather fight "for real"; the karateka whose kata is powerful and almost perfect or the guy who does a sloppy weak kata under the guise of "I include my personal bunkai"? P-U-U-U-U-L-E-E-E-Z-E! Again. You don't have to agree with me, in fact I hope you don't because you're taking my word and not developing your own thoughts. If you are upset with what I write; EXCELLENT! Now I dare you to explore your own mind and discover why. If you like what I write, great, dig in and start doing your own exploration. Cannon, W. (1939), The Wisdom of the Body (2nd Edition), W.W. Norton & Company: St. Louis, MO. Grossman, D. (1996). On Killing: The Psychological Cost of Learning to Kill in War and Society. New York: Little, Brown, and Company. Grossman, D. (2000). Teaching Kids to Kill, A Case Study: Paducah, Kentucky. Paper presented at the American Psychiatric Annual Meeting, Chicago, IL. (Full text available on-line at http://www.killology.com/print/print_teachkid.htm ). MacDonald, E. (1992), Shoot the Women First, Random House Publishing, New York, New York. Bruce Lee in the Dojo - Victim in the Street! Another entry sure to annoy many . . .
A couple of months ago I received a cracked rib when a lady in a chemically induced psychosis kicked the crap out of me with her boot. I had already been think a lot about Kumite training and that incident, coupled with an article I read on-line entitled "5 Reasons Karate is Useless" gave rise to the following diatribe. Every school applies a different significance to sparring as the Hanshi of the style sees fit. At the same time EVERY type of sparring has it's own benefits and it's own failures. First there's the concept of sparring, i.e. Kumite, in itself. "Kumite" does NOT mean sparring but rather "Grappling hands". Purpose; For the neophyte to begin working with other students, focus on and develop timing, accuracy and attacking/defending while moving with a partner. (b) Sanbon kumite - three step sparring, typically used to develop speed, strength, and technique. Disadvantages: None, IF, used properly in a systematic training curriculum. Purpose; Develops "Mizo no kokuro" (mind like water) . If you think about what technique you will use, you'll get hit. Liberating the mind and instinctively responding with a block or strike is the epitome of success in Jiyu Kumite. Because of this most schools do not allow mudansha below the rank of go-kyu to participate. Disadvantages: Many. Mostly the limitations of the approach; e.g. there are usually no-contact zones, limited contact zones. But the biggest advantage is the more we try to make Jiyu Kumite "authentic" or "Street worthy" the more we fail. Example: Many schools may advertise "full-contact karate" but not to the head. The great kicker will love this approach but it sets that individual up for failure and even injury in real life. If I'm 6 foot 4 and can kick the crap out of you before you can get close enough to kick me I have an advantage. However since I do not have to worry about a Monkey fist to the temple I soon fail to protect my head. In the street I'll take a kick most any day in order to get close enough to deliver a shuto to your temple. You may hurt me but I'll K.O. you. Who wins? The lawyers. 3) Shigoki (savage training) - While "Shigoki" is not true Kumite, Kumite engaged in during shigoki is similar to a "beat down initiation" into a gang. No respectable karate school engages in such training although there is the occasional exception usually including a perp parade on the nightly news. Purpose: No valid purpose. Seeing how much of a beating does not make you a man - it simply means you're stupid enough to be a human punching bag - Think of it as martial arts bullying. 4) "Authentic" Kumite. This fourth type of Kumite does not have an actual name (if you know differently please contact me). In Okinawa it was not unheard of for a karate student to venture into town or over to the "bad part of the village" (i.e. "B.C.Street") and get into a fight purposefully to perfect their techniques in a "real" fight. 1. This is Florida, everyone carries a gun. Karateka's who develop defenses against guns are known as "the dearly departed". 3. You scare off students by engaging them in Kumite before they have developed the basics needed to support their training. 4. Talented students are misled to believe they will be capable of successfully defending themselves in the street. 5. A karate student training to fight another karate student, so you can learn to protect yourself against a street thug, is sort of like practicing Spanish with another student studying Spanish so you will be ready to speak Portuguese on your vacation. 6. If you feel more "manly" by thumping and getting thumped in Kumite classes you have deeper seated issues which should be addressed at a psychological level before you continue your martial arts training. So now you're thinking, sounds boring. What is the "secret" of being ready and capable of defending yourself in the street. Makiwara training teaches you how to deliver devastating attacks AND blocks. Who cares how fancy or special your "spinning round house flying reverse monkey stomp kick" is if you have trained yourself to make EVERY block an attack, every straight punch a pile driver, every shuto a katana and every kick a jack hammer? In your first "real" fight you will remember nothing; but your body will automatically respond (muscle memory) with what you have practiced the most, i.e. (1) Chudan-uke, (2) Chudan-zuki, and (3) Mae-geri. If you have enough control, presence of mind, to deliver fancy advanced attacks, you're clearly fighting an unprepared opponent. That's not karate. Anyway that's my approach. Like it, modify it or blow it off. - - T.F.Y.Q.A. Oh. A request; if you read this blog and like or hate it please consider clicking on the "Join This Site" button above. Sometimes I feel like I'm talking to an empty room. - THANKS! !